For the first time in a while, I found time to play Card Hunter ranked, the love of my life . . . @CT5 was there, and we recorded my matches. Hey Sorcererers, we placed 6th in Citajul. Not bad, to be just 1 spot away from winning pizza! LieutenantCommanderData, CT5 and Pawndawan like this. For the first time in a while, I found time to play Card Hunter ranked, the love of my life . . . Thanks for the inspiration! I decided to try all human Nova Axe team in ranked. Just two warriors, since I have only 3 Nova Axes. On my first play, managed to deal 40 damage with AoA + Obliterating Chop. Good times! Still lost though. [SRC] Hans Wind drew All Out Attack. [SRC] Hans Wind drew Strong Hack. [SRC] typo took 3 Unholy damage. [SRC] Hans Wind took 10 Crushing damage. [SRC] Hans Wind doubles the damage with a ferocious follow-up! [SRC] Hans Wind discarded All Out Attack. Iaeu took 20 Slashing damage. Elven Maneuvers triggered draw for Iaeu. Iaeu discarded All Out Attack. Endanborn took 20 Slashing damage. CT5, ParodyKnaveBob and Flaxative like this. I loved the moment with bash, thrust, bash, parry, bash, thrust, ~sits thinking for a long time~ ... lol. CT5, Flaxative and Druidmask like this. And Nova Axe is in DD, life is good! I'm closing Aloyzo's Arsenal very soon, get in those submissions! ParodyKnaveBob, visak13, Druidmask and 1 other person like this. Ha, figured out what I was doing wrong. Having a warrior that can't get to your opponents=bad. CT5: But... they're.. he's too close to me right now. Flax: What?! What can he do? CT5: Stab, laser thrust... like four laser thrusts.. 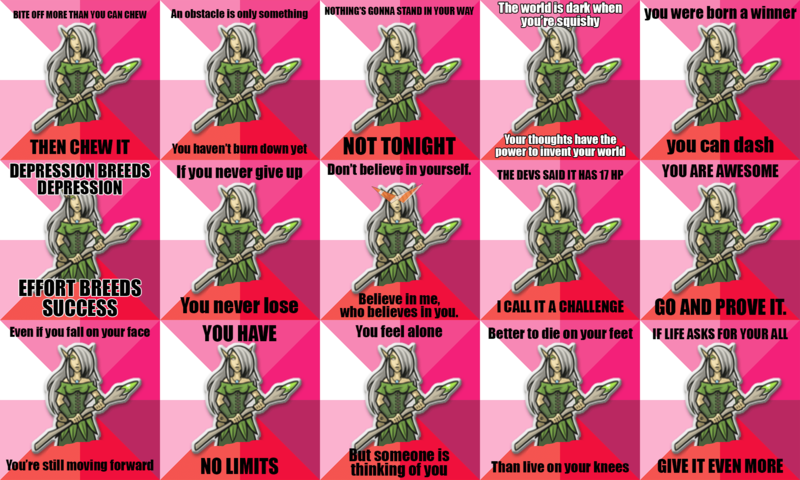 COURAGE, BELIEVE IN YOUR ELF! Sir Veza, Fifjunior7, PDXTai and 6 others like this. Merdis, ParodyKnaveBob, visak13 and 3 others like this. I had the same figure in mind, when I did these. omg yes holy crap these are fantastic! Hey Sorcererers, @Pawndawan totally just WON the first round of Aloyzo's Arsenal!! ParodyKnaveBob, CT5, Rainingrecon and 1 other person like this. Good job, comrade. This totally was not nepotism. Sorcererers totally wouldn't do that. ParodyKnaveBob, Pawndawan and CT5 like this. Also, yet another CONGRATULATIONS to @Pawndawan and his Dynamic Staff!